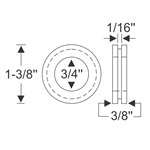 Grommet, headlight wire through wheel housing, two (2) per car. 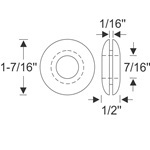 Sheet Metal Hole: 1-5/16" Center Hole: 7/8" Outside Diameter: 1-5/8" Slot Width: 1/16"
Grommet, for wiring through front body brace, right and left. 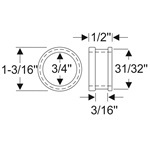 Sheet Metal Hole: 1" Center Hole: 7/16" Outside Diameter: 1-7/16" Slot Width: 1/16"
Grommet, spark plug wire organizer bracket. 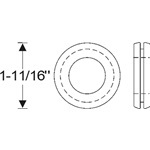 Sheet Metal Hole: 1/2" Center Hole: 3/8" Outside Diameter: 11/16" Slot Width: 1/16"
Grommet, various uses. 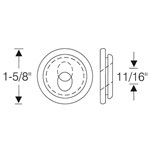 Sheet Metal Hole: 1" Center Hole: 7/16" Outside Diameter: 1-5/16" Slot Width: 1/16"
Grommet, horn and headlight wires crossover through radiator shroud. 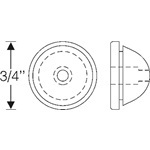 Two (2) per car. 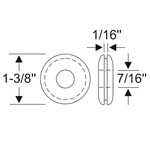 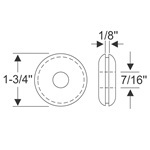 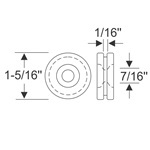 Sheet Metal Hole: 1-1/16" Center Hole: 7/16" Outside Diameter: 1-3/8" Slot Width: 1/16"
Special grommet with wide spacing for frame metal to pass electrical wiring and cables through frame. 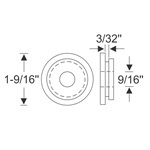 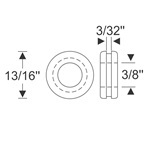 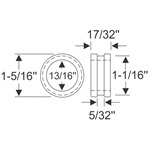 Sheet Metal Hole: 1-1/16" Center Hole: 13/16" Outside Diameter: 1-5/16" Slot Width: 5/32"
Special grommet with wide spacing for frame metal, to pass electrical wiring and cables through frame. 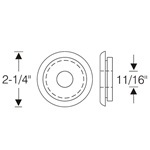 Sheet Metal Hole: 31/32" Center Hole: 3/4" Outside Diameter: 1-3/16" Slot Width: 3/16"
Grommet, upper side rail, for styles with removable rails. 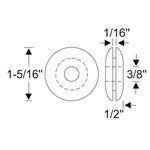 Sheet Metal Hole: 1/2" Center Hole: 3/8" Outside Diameter: 13/16" Slot Width: 3/32"
Grommet, license light wire. 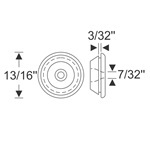 Sheet Metal Hole: 5/8" Center Hole: 7/32" Outside Diameter: 13/16" Slot Width: 3/32"
Grommet, windshield wiper control cable or gas gauge wire through rear compartment pan. 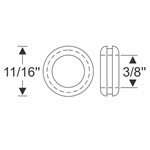 Sheet Metal Hole: 7/16" Center Hole: 1/8" Outside Diameter: 5/8" Slot Width: 1/16"
Grommet, electrical wires (various). 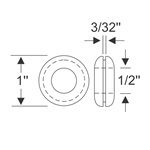 Sheet Metal Hole: 1/2" Center Hole: 1/4" Outside Diameter: 3/4" Slot Width: 1/16"
Grommet, wiring harness through fender skirts, or hood latch lower mounting panels. 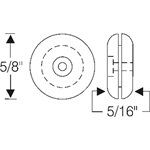 Also other miscellaneous uses. 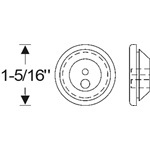 Sheet Metal Hole: 1-1/16" Center Hole: 3/4" Outside Diameter: 1-3/8" Slot Width: 1/16"
Grommet, headlight wires through inner wheelhouse panel, two (2) per car. Sheet Metal Hole: 3/4" Center Hole: 1/2" Outside Diameter: 1" Slot Width: 3/32"